This year’s fundraiser is going to be bigger and better than ever, and today’s blog includes four of the reasons why. Rather than save our coolest things for last as we’ve occasionally done in the past, we’re launching out with big items that are all going into the lottery, which means for every $10 you donate on our fundraiser page you have a chance to win them and a ton of other prizes. JoCo Cruise 2017 is a cruise ship full of music, comedy, and general nerdery. The 2017 cruise departs from San Diego, CA on Saturday, March 4th for a 7-night adventure along the Sea of Cortez and will return on Saturday, March 11. I’ve gone on the JoCo Cruise for two years in a row now, and 2017 will be my third trip out. I didn’t know if I’d like going on a cruise, because honestly? I’m a bit of a cave dweller. But despite my initial reservations, I have to say, I absolutely love it. It’s a great atmosphere, and this year’s cruise will be the first time the geeks are taking over the entire cruise ship. It’s the best time. I’ve had more genuine interactions with fans and other geeks on the boat than I can hope to have at a convention. So I’m delighted to announce that JoCo Cruise has donated a balcony cabin on the boat to Worldbuilders, and we’re putting it in the lottery where anyone who donates at least $10 can win it. You’ll still need to pay for your own flights to and from the cruise, but once you’re on the boat you’re pretty much golden. There’s free food and drinks (with some options you’d have to pay for), concerts, events, panels, and so, so much more. The JoCo Cruise folks made a handy-dandy list for us of everything this does and doesn’t include, but the big thing is that every $10 you donate gets you another chance to win this awesome trip. The lovely folks over at Geek Chic have offered up one of their elegant gaming tables for this year’s Fundraiser. Geek Chic makes gorgeous stuff. 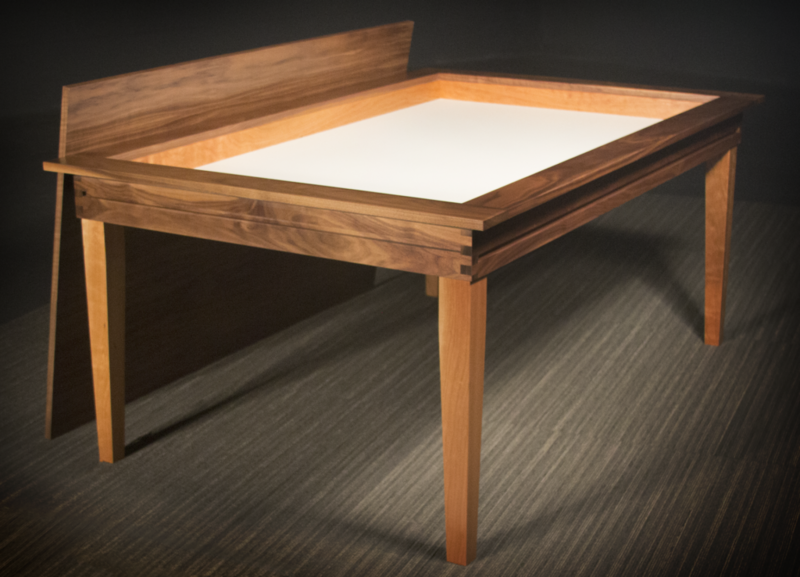 This table has an inset game field, so not only will your dice not roll onto the floor, but the replaceable top means you can cover up a partially finished game and still have a functional table you can use for eating dinner or doing work. 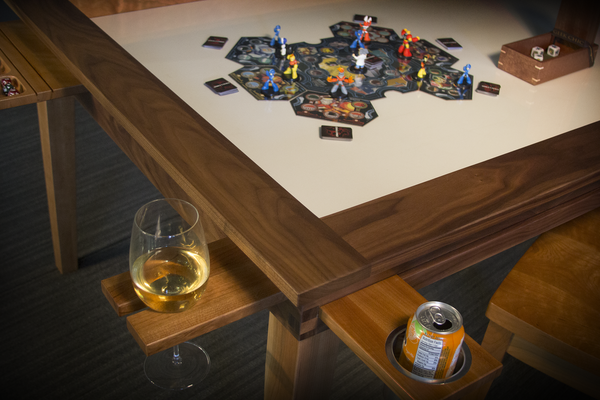 The table also has a grooved rail system that allows you to add on things like cup holders, trays, and dice containers onto the *side* of the table without cluttering up your game or risking spills. If you win this prize and want to customize your Vanguard, adding accessories or picking fancier woods, Geek Chic will give you the $2500 value of this table as credit toward your new configuration or anything else you’d like to buy from Geek Chic. Including a different table. Even international donors have a chance of winning this, but we’ll coordinate with the winner after the fact, since international shipping can be tricky on something this large. Remember, you get a chance to win it for every $10 you donate to the fundraiser and select games as something you’re interested in winning. 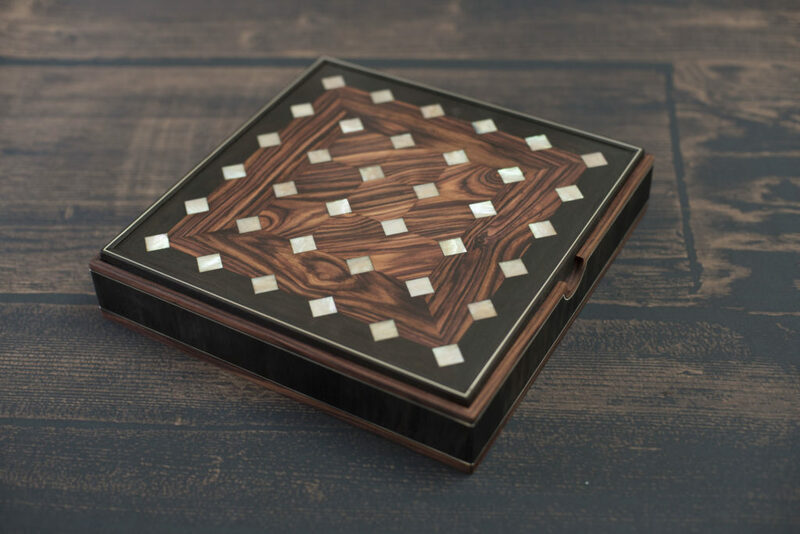 Some of you might recognize the Wyrmwood’s handiwork from the recent Tak kickstarter, where they made Devi’s Box and Devi’s Board. Well this year for Worldbuilders, they made us something special…. Seriously. Look at it. It’s gorgeous. 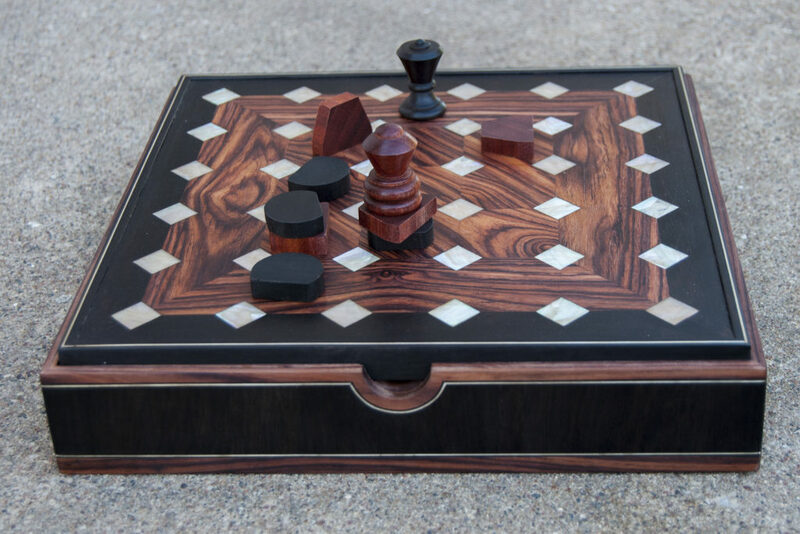 It’s a handmade, one-of-a-kind Tak set, constructed with Kingwood, African Blackwood. (All ethically sourced.) 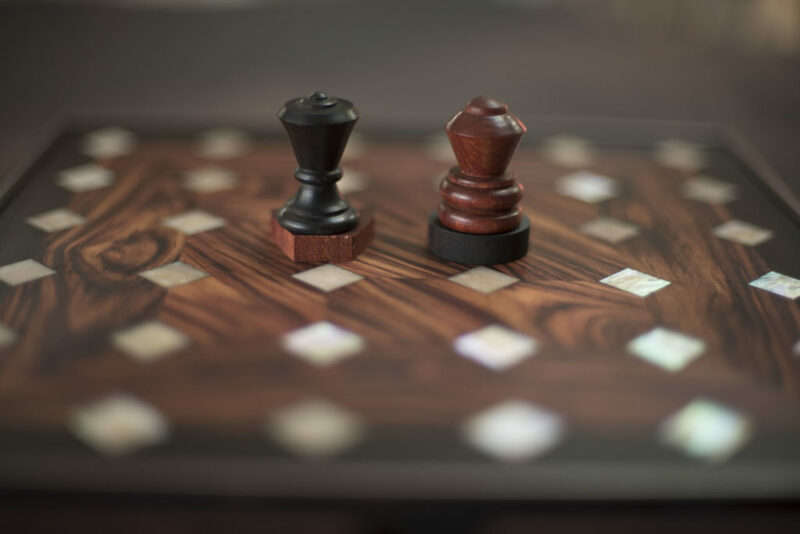 The board has solid silver stringing and mother-of-pearl inlay. If they were selling them, the retail cost of this board would be around $5,000. But they’re not selling them. Even I don’t have one. This item is just available for some lucky geek to win if they donate to Worldbuilders. For those of you who love books more than games, the rest of the blog contains gorgeous limited-edition books from Subterranean Press. Sub Press has been around since the beginning of Worldbuilders, and all but one of their donations is going into the lottery. All told, there’s over 200 books going into the lottery today. Many of them signed, numbered, or otherwise rare. Copies of The Burglar Who Counted the Spoons by Lawrence Block, Down and Out in Purgatory by Tim Powers, and Freedom of the Mask by Robert McCammon. Subterranean Press always goes the extra mile to make truly beautiful books, so we love being able to show them off. They work hard to make their books incredibly high quality, and they don’t miss the mark. 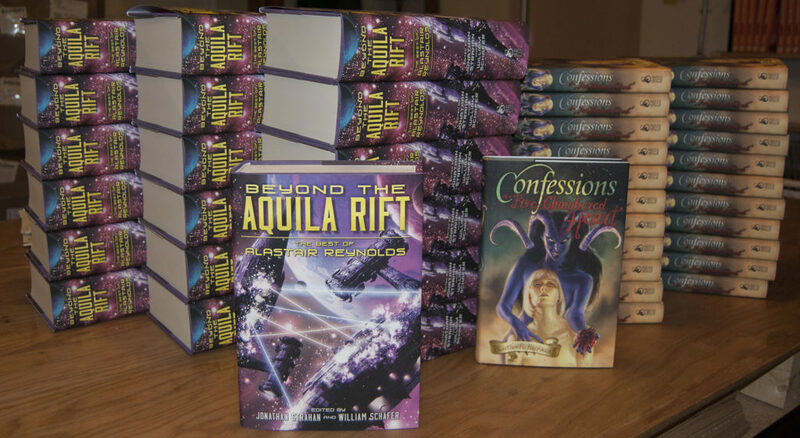 Copies of Beyond the Aquila Rift by Alastair Reynolds and Confessions of a Five-Chambered Heart by Caitlin R. Kiernan. There’s more than just novels going in, too. Both of these books are collections of stories from some of the best authors in their genre. Confessions is completely sold out, and the only place left to get a copy is here in the lottery. Signed & numbered copies of The Days of Tao by Wesley Chu and The Authentic William James by Stephen Gallagher. Each of these limited edition books was limited to 1,000 numbered copies, so you’re getting a real rarity in them. Signed & numbered copies of The Mallet of Loving Correction by John Scalzi and Amityville Horrible by Kelley Armstrong. John Scalzi’s collection of posts from his blog, Whatever, is a deep dark look into the things on his mind over the time between 2008 and 2012, which is both horrifying and hilarious. Amityville Horrible is a wonderful horror story for more traditional reasons: it’s full of ghosts, necromancy, werewolves, and murder. It was limited to 1500 numbered copies which are all leather-bound and gorgeous. 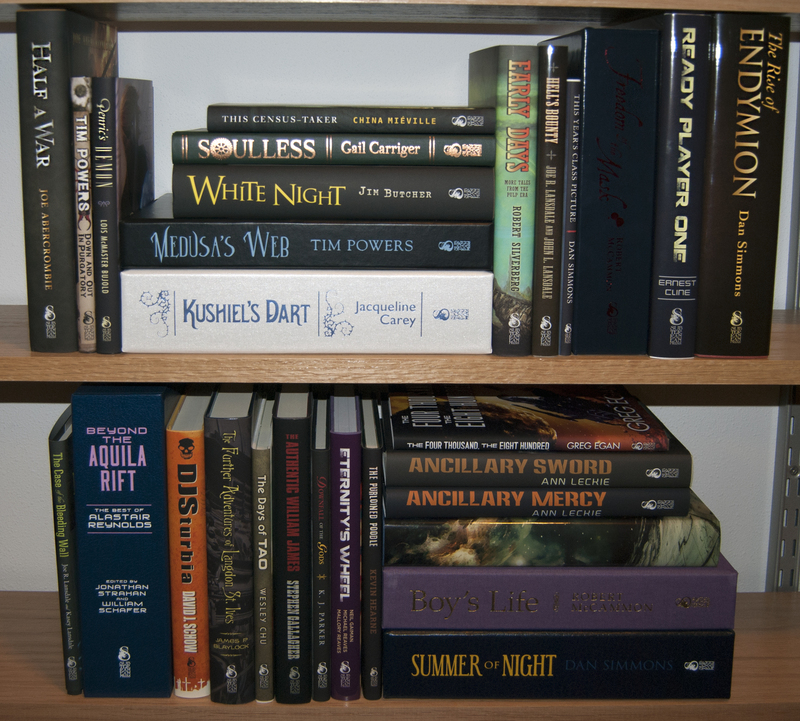 Auction: One of every book published by Subterranean Press in 2016. This is one of the coolest things Subterranean has been doing for a while now, which is a collection of every single book they’ve published in the last year. It includes some of the books already featured in the fundraiser, plus a bunch more, including some that haven’t come out yet. There are 38 beautiful books in this bundle. To add some serious class to your bookshelf, you can bid on this auction right here. Happy first day of the fundraiser, folks. Remember that I’ll only be posting a few times throughout the fundraiser, but Worldbuilders will be updating their website every day with new items in the lottery, auctions, and stretch goals. 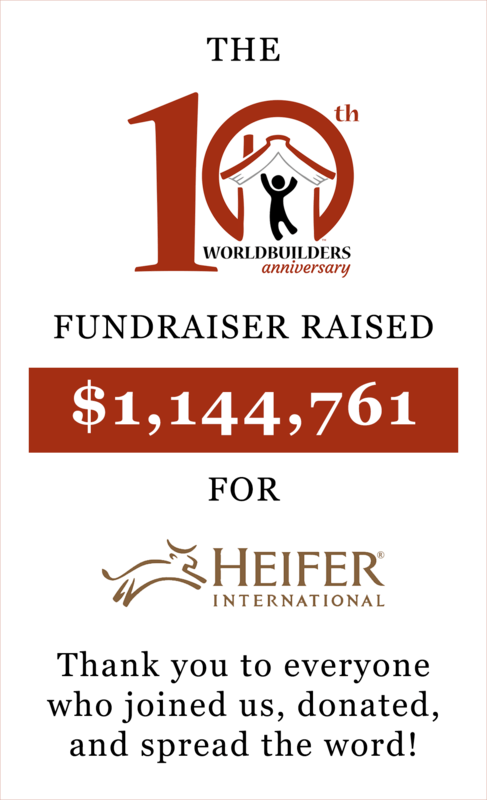 Let’s show Heifer International what we can do with $1 million in matching money. Beautiful. I’ll try my best to double my gift again this year, but it’s starting to get to the point where physics might limit me. So excited. Unrelated: went as Harry Dresden to a writer’s con in Salem, MA last week. You know, cause you’re a Dresden boy. When selecting lottery categories with our donation, does the Geek Chic table fall under “games” or “art”? Games! I’ll add that into the blog so it’s more clear, thanks for asking. Wish I’d checked the comments before donating, I checked everything off to be safe. The table and board are beautiful. The boat is a boat, but the people inside make it special! I can’t wait to see the stretch goals! But what if these aren’t the big guns? These are big guns. But there are also other big guns on the way. This is all good news, but I am still having trouble shaking this funk. I know its an old questions and I know you hate hearing it, Pat, but I feel like it would help make the world look a little brighter if I had an idea about book #3. I was as patient as three stones, but then I ate them It seemed a good idea at the time. I can’t recall exactly when he said it, but at some point, I believe Pat said that we can expect the book in 2025, and if it comes any earlier, it can be a happy surprise. I think your asking about the date for Doors of Stone is really insensitive. 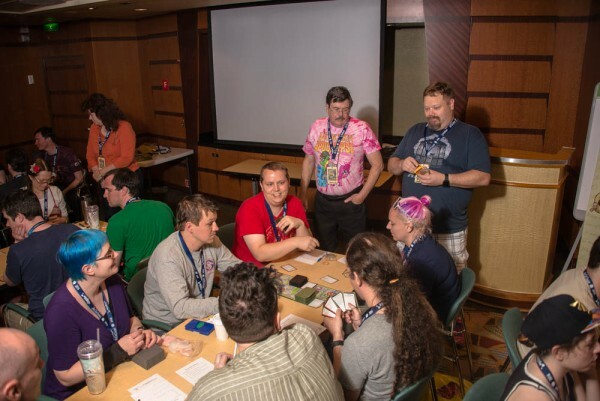 Pat has mentioned repeatedly that he was not happy with how he let his family life slide while he was frantically trying to pull together Wise Man’s Fear, and he has a right to spend time with his family and spend time spearheading wonderful fundraisers like Worldbuilders. What he’s doing is good for the soul and the world. Don’t begrudge the man happiness over a book, please. Even a lovely book. It will be worth the wait, I’m certain. Can we have a date and/or timeline for last years stretch goal of Max redoing Pat’s office? I donated twice to help make that happen…and it hasn’t happened. We’ve been working out the logistics on that, as Max and I are both more busy than is healty, and Max also wants to take video of the event and all my weeping around it. The other complication is that I’m considering moving my office outside my house. I didn’t want Max to put in all the work, then effectively trash it all when I moved in two months. Thank you for the update! I’m looking forward to it.